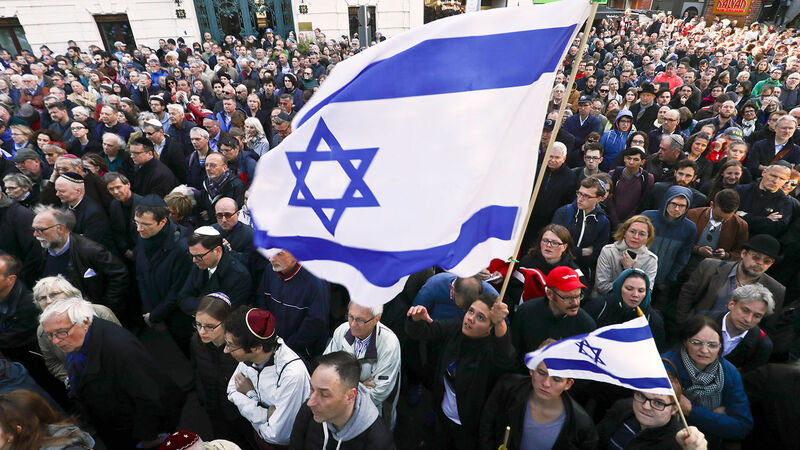 Germans wave Israeli flags on April 25, 2018, as part of the Berlin Wears Kippa rally in solidarity with the Jewish community, following a series of anti-Semitic incidents. There is a reason why Berlin has Germany’s worst anti-Semitic problem. Most of these incidents receive little public attention, but those that do, show a deep-seated hatred for Jews. A recent example of this open hatred was last November’s harassment of Israeli European correspondent Antonia Yamin. While Yamin reported on the streets of Berlin about Brexit, she was suddenly interrupted by passers-by who threw firecrackers at her. The offenders were German adolescents. The man was not a Muslim, not a rebellious teenager or outward extremist. He wasn’t speaking under the influence of alcohol or as a result of provocation. Instead he was an average 60-year-old man who explicitly expressed his anti-Semitic views without shame. It didn’t even bother him when the girlfriend started video-recording him. The effects of that propaganda are still seen today. Next to Berlin, Bavaria is the state with the most reports of anti-Semitic crime. While this gives us some insight into why Bavaria and Berlin are most prone to being plagued by anti-Semitism, it doesn’t explain the recent surge in anti-Semitism. Hitler’s propaganda today is repeated by the right-wing Alternative für Deutschland, in online blogs, social media and even in the mainstream media’s anti-Israel bias. Seen from the perspective of a German anti-Semite, Germany’s problems all trace back to the Jews. Because of the Jews, Germany today is accused of having committed a great genocide. Because of the Jews, Germany’s government is apologetic and withdrawn from world power. Because of the Jews, there is the Israeli-Palestinian conflict that causes tensions throughout the Middle East and drives Muslims and Jews to Europe. Germany rejected the history of World War i and started another world war. Today, Germany rejects the history of World War ii. How can we believe that history will not repeat itself? The Jews have indeed been at the center of history’s conflicts and a world war. Today, we find the Jews in the midst of persecution, again not as perpetrators but as its victims. The reason behind this reveals one of the most horrifying truths about our world, but it also reveals a wonderful hope beyond that. Conspiracy theory after conspiracy theory has been proved wrong. Jews were not responsible for the Black Death, neither for the financial crisis prior to World War ii, nor for any other crisis that men brought on themselves and accused the Jews of. Some say it is because the Jews crucified Christ. Hitler claimed the same in 1926, when he said, “Christ was the greatest early fighter in the battle against the world enemy, the Jews …. The work that Christ started but could not finish, I—Adolf Hitler—will conclude” (Adolf Hitler, John Toland). Of course that is not true. Christ didn’t fight anyone when He was on Earth except Satan and his influence. While some Jews were directly involved in Christ’s crucifixion, the Bible says all of us have sinned and are therefore responsible for Christ’s death (Romans 3:23). Another lie evident from Hitler’s statement is that anti-Semitism supposedly started in Christ’s day. But the entire Old Testament testifies against this fact. Jews, and Israelites in general, have always suffered persecution. Moses experienced it firsthand. In his early childhood, he was separated from his parents to save him from death. God delivered Israel through Moses because the persecution became so unbearable that the people cried out to God (Exodus 2:23-24). In 167 b.c., Antiochus Epiphanes invaded Jerusalem with the goal of utterly destroying the Jewish faith. Then, after the birth of Christ, King Herod demanded the death of all Jewish infants. Hitler’s insane reasoning cannot be explained unless you consider what the Bible says about the spirit world. Because the world has rejected God and the Bible, it cannot understand the source of anti-Semitism. For this lack of understanding, 6 million Jews were killed in World War ii and mankind as a whole has suffered through the ages. In these verses we see what Mr. Flurry explained above. While the hatred manifests itself as a hatred against Israel, it is a disguised hatred against God. That’s the biblical answer to the question of the origin of anti-Semitism: it originates in mankind’s hatred of God. But while mankind has rejected God, He has not given up on man. His master plan includes the resurrection of all people who have ever lived and never knew the true God. This is the most wonderful news mankind could ever hear. After the Psalm 83 alliance nearly succeeds in erasing Israel from the map, the people will learn their lesson and again turn to God. Israel will finally trust solely in God for peace, and their example will turn the whole world to God. Read Chapter 2 of Mr. Flurry’s booklet The King of the South for more information. He explains how this hatred against Israel will soon manifest itself and the wonderful news that follows thereafter.